I’m not sure how humans began using microbes (bacteria and fungi) in food production but it was well before we even knew what microbes are. Nevertheless, microbes are useful because they can undergo a process called fermentation. This process is similar to human anaerobic respiration but produces different end-products. See, microbes are different from us and can actually thrive in anaerobic or oxygen lacking environments. Bacteria are quite simple and unlike our cells lack key components necessary for aerobic respiration. 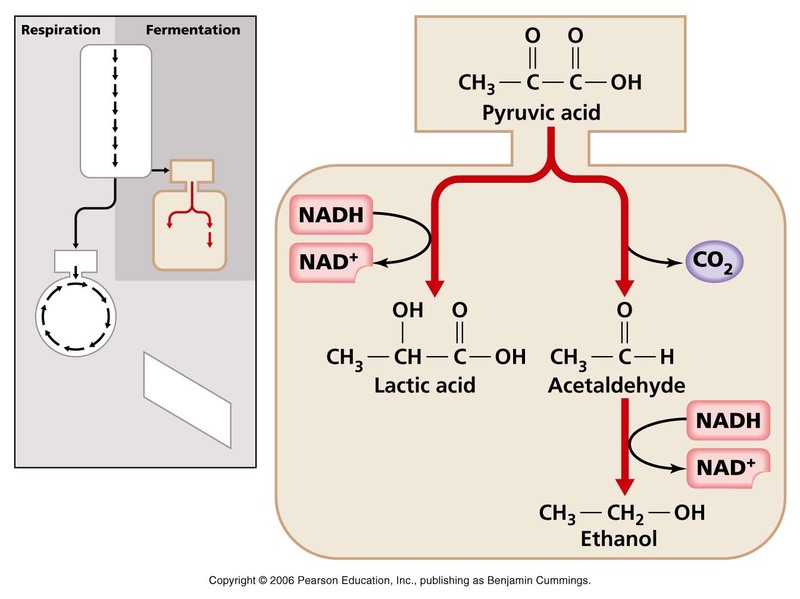 Therefore, they undergo fermentation which results in the production of byproducts such as ethanol (alcohol), carbon dioxide, or lactic acid. Although simply byproducts for the bacteria, humans taken advantage of them to make food. So what are some of these commonly used microbes? Saccharomyces cereviceae is a common strain of yeast. These little guys have been used everywhere from my old lab to wine, beer, and bread making. They convert sugars present in foods into ethanol and carbon dioxide. 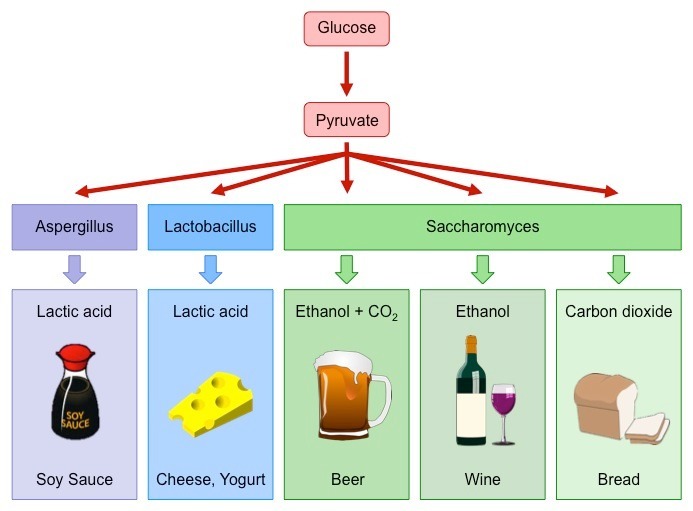 These sugars range from maltose in barley for beer, glucose and fructose in grapes for wine, or starch in wheat for bread. The alcohol gives beverages its distinct properties while the carbon dioxide helps develop taste and fizziness. In terms of bread, the carbon dioxide makes the dough rise while ethanol evaporates during the baking process. Lastly I wanted to mentioned kombucha which is fermented tea. In this case the fermentation involves SCOBY or symbiotic culture of bacteria and yeast. The exact composition of the culture varies but generally consists of Acetobacter sp. along with various yeasts such as Bretanomyces sp. and Saccharomyces sp. All in all, the sugar in the tea will feed the culture which will give off useful bi-products such as a bit of alcohol, acetic acid and gluconic acid. The gluconic acid is key for kombucha and is believed (although not well researched) to have liver cleansing properties. La voila! Here are some of the common microbes we use in our food. Metabolism 101: Why Anaerobic Respiration? Our bodies can break down glucose through two ways, with or without oxygen. What determines how it’s broken down? Well remember that reducing agent, NAD+. Yeah… that little guy that accepts electrons from others to become NADH+ H+. The balance between NAD+ and NADH+ H+ is the key, let me explain to you why. 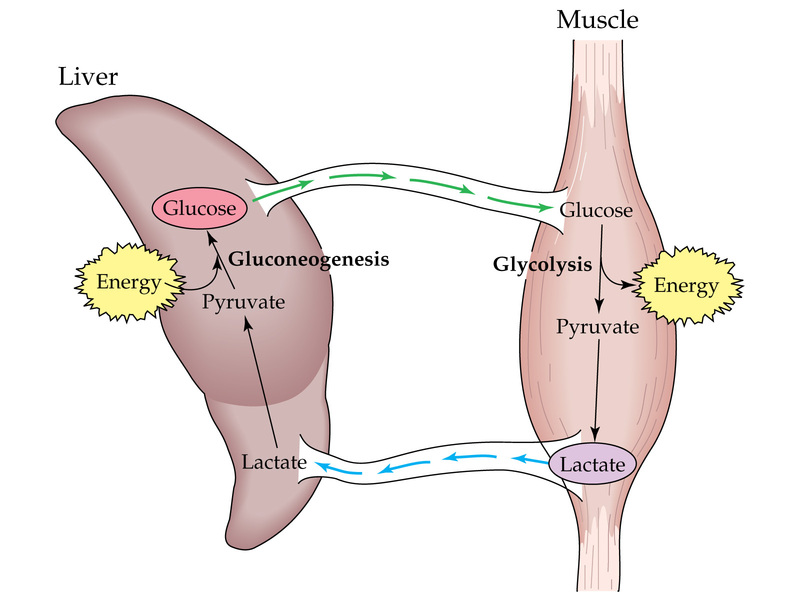 Typically glucose breakdown consists of 3 distinct parts- glycolysis, Kreb’s cycle (aka citric acid cycle aka tricarboxylic acid cycle), and electron transport chain (ETC). I will focus on the big picture as I have memorized these pathways in detail multiple times for school just to forget them. In glycolysis, the 6 carbon glucose is broken down into two 2 carbon pyruvate molecules. 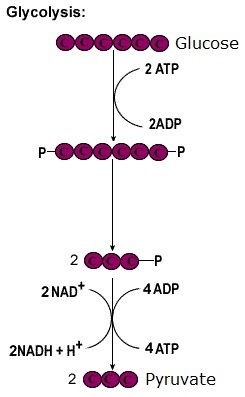 Through the process there’s a net production of 2 ATP molecules and 2 NAD+ molecules get reduced to 2 NADH+ H+. Subsequently, each pyruvate molecule loses a carbon as carbon dioxide, generates another NADH+ H+, and eventually becomes acetyl-CoA. 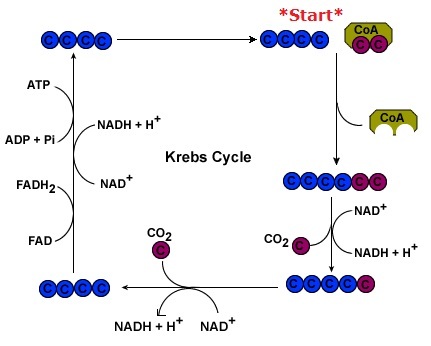 Then each acetyl-CoA will enter the Kreb’s cycle to be fully broken down into 2 carbon dioxide molecules, 3 NADH+ H+, 1 FADH2, and 1 GTP (like ATP). At this point the glucose has been fully broken down. Now the big money (ATP) maker is the electron transport chain reaction. Here NADH+ H+ and FADH2 will unload their gained electrons to produce ATP. 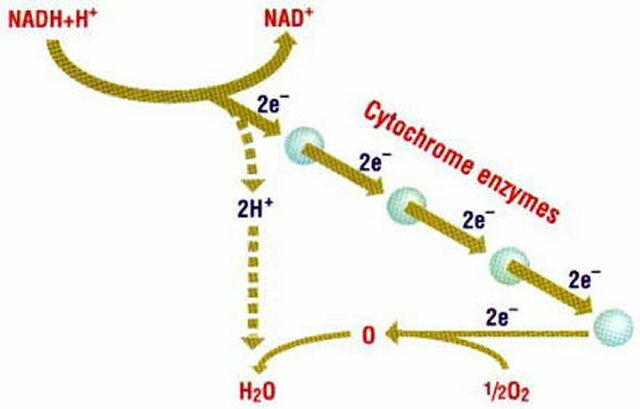 The process is driven by oxygen which will react with NADH+ H+’s electrons and hydrogens to form water. At the same time NAD+ and FAD will be reconstituted. In total, aerobic respiration will yield 38 ATPs. This is the reason why we undergo anaerobic respiration. We can only sustain anaerobic respiration for a short time and hence will die without oxygen. In the next post I’ll talk about what happens to that lactose and how anaerobic respiration has been taken advantage off in food production. People talk about enzymes all the time, especially raw vegans. It’s all about making sure that we don’t denature the enzymes in our food or using enzymes to help digest our food. Well, enzymes are about a lot more than that! Basically, enzymes are biological catalysts. A catalyst is something that will speed up the rate of a reaction. In biology, catalysts are a bit different because they don’t just speed up reactions but actually allow them to happen. Furthermore, enzymes are proteins so our bodies make them based on our genetic blueprint. Biological catalysts, what does that mean? 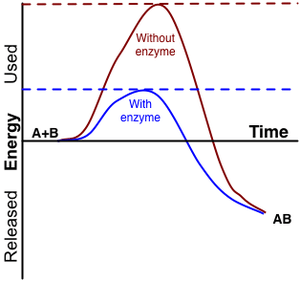 It means that they will lower the initial energy requirements (activation energy) necessary for a reaction to occur. Remember the post about exothermic and endothermic reactions? Looking at the energy diagrams again you can see that in-between products and reactants there is always a high energy “bump”. It is the energy investment needed for that reaction. This investment is usually very high and prevents the reaction from occurring. It’s sort of like having to pay a 95% down-payment for a house; it’ll detract anyone from buying it. That’s where enzymes come in because they lower this bump, thus making the reaction possible. How do enzymes make reactions happen? It is believed that enzymes provide a space where reactants can come together in a specific orientation. You can think of them as a conference organizing committee. They will invite important individuals to a specific location, thus facilitating them to come up with ideas. 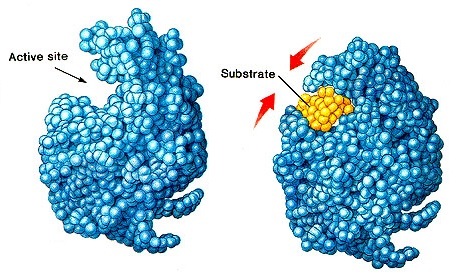 Furthermore, enzymes will have an active site pocket within them where the substrate can enter. That’s where the reaction will occur. Apart from being able to make reactions occur, they can also regulate them. Think of it, enzymes are proteins which are controlled at the genetic level. Certain stimuli can turn genes on’n’off, in turn modulating the production of that enzyme. For example, when you sit down to eat a bowl of pasta, your body will increase production of salivary amylase to break down the starch in the pasta. Alternatively, absence of food will do the opposite.